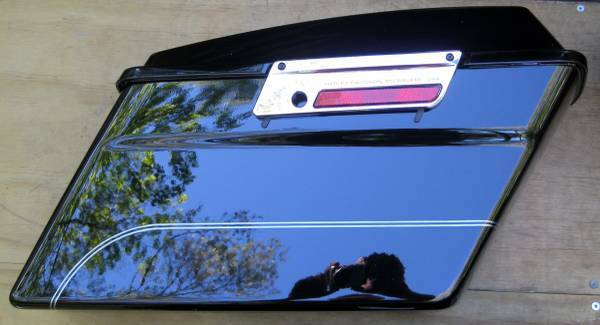 This right side saddlebag is OEM, factory vivid black paint with silver stripes P/N 90897-04BHY, for a 2009 Harley Davidson Ultra Classic Electra Glide, but will fit many other FLH touring models. It is brand new old stock and is complete as seen in the pic's. ( Also comes in the original box.) $350.00 I don't text so, Include a phone number with your reply if you want me to reply back to you, this helps eliminate the Riffraff and Strokers. Thanks for looking.